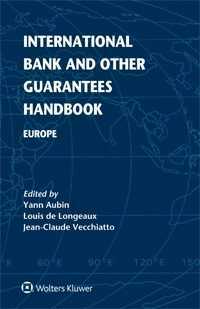 International Bank and Other Guarantees Handbook provides an in-depth review of the legal and regulatory requirements applicable to guarantees. Guarantees provide a party (beneficiary) with assurances that the underlying contract (for the delivery of goods or services or financing) will be performed on its original terms or that it will be indemnified in case of failure to do so. The knowledge of guarantees and their functioning under various national jurisdictions are essential for principals, guarantors and beneficiaries, particularly while framing international contracts. This enormously useful handbook provides a practical overview of the guarantee regimes in twenty-eight European countries, with country-by-country contributions from regional expert practitioners and academics. For easy comparison, each country report follows the same structure, from preliminary discussion on the provisions of a guarantee to its negotiation, drafting and enforcement. Each chapter includes references and model guarantee forms that readers can use to draft their own documents. This handbook contains a chart summarising each guarantee (with their salient features) and a number of standard guarantees available online. Following an identical structure, each country chapter helps to gain an easy and quick access to practical responses to the questions that practitioners have when setting up or managing a guarantee in Europe. Invaluable to corporate counsel and law firms with an international practice, this peerless handbook proves the first order of business in trade negotiations across Europe, among European nations themselves as well as with their global partners.